Next year it will be 400 years since the Roman Inquisition concluded that Galileo Galilei was wrong and that the earth and not the sun is the center of our solar- strike that- Ptolemic terra-centered system. And in a manner that one might argue was a precursor to the mafia, they made Galileo an offer he couldn't refuse- recant or be put to death for heresy. Since Galileo's mom had no dummies, Galileo, like modern-day media, choose survival in lieu of being an intellectual purist. His friend Giuseppe Goombah heard Gal say, "Hell, I know I'm right. Better to live so I can fight another day. One has the feeling today that the only reason one cannot still get a good argument as to the earth's place in the solar system is because the intellectual successors of those who ran the Roman Inquisition are too busy denying global warming in the face of uncontroverted evidence. Rather, they continue asserting their egocentric view of humanity to the exclusion of all other life, which in itself is the problem. Alas, I think even Galileo would not back down on this one, since the evidence is more and more overwhelming that scientists have actually been conservative in their projections as to just how fast and irreversible the changes our unabated and even increased use of fossil fuel is causing. And I must confess that my own left wing views have put me in mortal danger of falling off of their flat world into oblivion. Not willing to take this militant ignorance lying down, producer-director James Cameron, Harrison Ford, Don Cheadle, Arnold Schwarzenegger, Jerry Weintraub and other luminaries of our epoch continue to exhibit hubris and an unwillingness to accept our fate to be literally burned alive in a hell of our own making. To that end, they have produced a series of programs for Showtime entitled The Years of Living Dangerously that has well-known celebrities and scientists going around the world to see firsthand how global warming is rapidly making our miraculous and unique green orb unfit for human life. Whether this has any effect on truly non-spiritual religious and greedy corporate fanatics is doubtful, given the past performance of their species. However, I think Chris Hedges recently put what Cameron and Co. are doing something like this: Whether we are able to avoid humanity going over the edge into the abyss, given a choice between cynicism and living in a manner that accepts the futility of human struggle, if I have to go down, I choose to go down living my life consistent with moral values and the ideals of my youth. 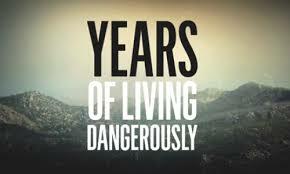 By clicking on the following link at: theyearsoflivingdangerously.com, you can see for yourself the first episode of the daunting reality and task we now all face. Since our "creation" G-d has continued to pose the same question to humanity- life or death- while the means of our self-destruction has only gotten greater and greater throughout human history. One has the feeling that HaShem- real or metaphor- might once and for all want humanity to choose whether they want to make heaven or hell out of this planet. El año que viene va a ser 400 años de la Inquisición Romana concluyó que Galileo Galilei estaba equivocado y que la tierra y el sol no es el centro de nuestro sistema solar - huelga - Ptolemic sistema terra - centrada . Y de una manera que se podría argumentar fue un precursor de la mafia, que hizo Galileo una oferta que no podía rechazar , retractarse o ser condenado a muerte por herejía . Dado que la madre de Galileo no tenía maniquíes , Galileo elegir la supervivencia en lugar de ser un purista intelectual. Su amigo Giuseppe Goombah oyó Gal dice: " Caray, yo sé que tengo razón. Mejor vivir , así que puede luchar otro día . Uno tiene la sensación de hoy que la única razón por la que no se puede todavía conseguir un buen argumento en cuanto al lugar de la Tierra en el sistema solar se debe a que los sucesores intelectuales de los que corrieron la Inquisición Romana están demasiado ocupados negando el calentamiento global ante la evidencia de un hecho no controvertido . Más bien ellos siguen afirmando su visión egocéntrica de la humanidad , con exclusión de toda otra vida , que en sí mismo es el problema. Por desgracia , creo que incluso Galileo no daría marcha atrás en este caso , ya que la evidencia es cada vez más abrumadora que los científicos han estado realmente conservador en sus proyecciones en cuanto a cómo los cambios rápidos e irreversibles es nuestra abuso persistente e incluso aumento de los combustibles fósiles causando . Y debo confesar que mis propios puntos de vista de izquierda me han puesto en peligro mortal de caerse de su mundo plano en el olvido. No estoy dispuesto a tomar esta ignorancia militante acostado, productor y director James Cameron , Harrison Ford, Don Cheadle, Arnold Schwarzenegger , Jerry Weintraub y otras luminarias de nuestra época siguen mostrando la arrogancia y la falta de voluntad para aceptar nuestro destino a ser literalmente quemado vivo en un infierno de nuestra propia creación. Con ese fin , se han elaborado una serie de programas para Showtime titulado Los años que vivimos peligrosamente que tiene celebridades y científicos de renombre va todo el mundo para ver de primera mano cómo el calentamiento global está haciendo rápidamente nuestra orbe verde milagrosa y única no apta para la vida humana . Si esto tiene algún efecto en los fanáticos religiosos y corporativos codiciosos realmente no espirituales es dudosa, dada la evolución pasada de su especie. Sin embargo , creo que Chris Hedges recientemente puso lo que Cameron y compañía están haciendo algo como esto: Si somos capaces de evitar a la humanidad pasar el borde al abismo, les da a elegir entre el cinismo y vivir de una manera que acepta la futilidad de la humana lucho , si tengo que bajar, elegir a bajar a vivir mi vida coherente con los valores morales y los ideales de mi juventud. Al hacer clic en el siguiente enlace en: theyearsoflivingdangerously.com , se puede ver por sí mismo el primer episodio de la realidad de enormes proporciones y de la tarea que hoy enfrentamos . Desde nuestra "creación" Dios no ha dejado de plantear la misma pregunta para la vida o la muerte a la humanidad - , mientras que los medios de nuestra autodestrucción sólo obtenido más y más a lo largo de la historia humana. Uno tiene la sensación de que HaShem -real o metáfora - podría una vez por todas que la humanidad a elegir si quieren hacer el cielo o el infierno de la tierra. ‹ ARE POLICE SOMETIMES THEIR OWN WORST ENEMIES? WHY? THE FLAT EARTH: "When a child is born, the world is born with him. When a man dies the world dies with him". Looking from that perspective the Sun does revolve around the Earth. I have no problem with that. I see it every day with my own eyes, but, unfortunately, I could not find any place in the Torah, where it says that the Earth is flat. As much as I don't like to disagree with The Torah, as I grow older, and my capacity to sustain illusion becomes less and less, the more I notice that the planet I am forced to live on is not just the discus like the one created by Terry Pratchett (the sci-fi writer), but the two dimensional figure with various cutouts and the very sharp edges. The majority of humans who live on this planet are two-dimensional as well, which suits them perfectly. It allows them not to have the unconscious with its depth of creativity and vision, but, mainly, extricates the much maligned guilt from the daily existence, thus, allowing the pursuit of very desirable things like power, wealth and control, without the tinge of doubt in their perfect entitlement to grab whatever they can. I mentioned the very convenient cutouts all over the surface of that planet. They are really wonderful. First, useful materials are being extracted from an area of the flat earth. Whether they are oil, coal, forests or diamonds - it does not matter. The point is to gather as much of this material (of course, only, if it is cost-effective) as possible... and then the blissful, the orgasmic sense of control... "It's mine and I can do with it whatever I want,"- proudly exclaims the high-achieving two-dimensional. He truly believes in HIS god's given right to acquire and to use. HIS god listens to his commands and obeys. As soon as the last crumbs are taken, a huge hole opens up in the ground and all the garbage, all of the disposable elements, including entire species of animals and plants fall out into the nowhere, leaving his beautiful, personal backyard smelling fresh and sweet. Nowhere has no consequences. I forgot to mention - the two-dimensional world has a perfect tool. It is called The Scripture. It can be used as a carrot and as a whip. It can be interpreted in any each way that is economically and politically convenient. It makes the 'likes' of the statement: - "an eye for an eye, and tooth for a tooth", providing another god's given right for the violence of revenge. Without the additional depth dimension of Talmud, who cares that the actual meaning of this statement is the legal requirement of monetary compensation by the person who caused the trauma to the victim of his action. Scripture is a really fantastic equipment. The ones who know how to use it can promise paradise, or terror of hell and brimstone. They can start a war killing multitudes, and then call it "holy". It is not "the opium for the masses" as the communists proclaimed, but the invisible wiring used for over two millennia of control. The sharp edges at the end of the landscape have their uses too. They are used to cut the voices, the heads, the rights to safety and self-expression of the three-dimensional beings who dare to think differently, believe differently, live differently. They dare to peek into the fourth, the fifth or any dimension they can find, searching for meaning and the answers. They represent the ultimate threat to the oblivious well-being of the two-dimensionals, by knowing and saying out loud that all actions have consequences. The sharp edges and the abyss beyond are extremely convenient for their disposal. I walked to the edge of The Flat Earth and saw the horror. I, also, saw the mystical beauty of space. Unlike Galileo, I can't recant. First, because I am a Jew. We get killed by the millions, whatever we do. Second, because I am a Jew. My soul was there, at Har Sinai, together with the souls of my ancestors. I heard the voice of Kodesh Boruchu, when He said: "I give u life and I put death before u, so u choose life. I put sorrow and joy before u, so u choose joy". We answered: -"Na'ase V'Nishma" - we shall do and we shall listen. My God did not just give us the choice, he clearly stated his preference. He wanted us to live; he wanted us to know happiness, and the The United States Constitution confirmed His wishes and gave us those rights. May it never be rewritten! I am a Jew! My Torah has the unfathomable depth. It has Chumash, Mishna, Gemorah, Midrash, Prophets, Judges, Kings, Hazal and the Hassidic masters. It has books written by King Solomon and Psalms of King David. This power cannot be casually picked up by an individual, or even a group, and waived in the face of the people to manipulate them into submission or conversion. There is no question that I am an elitist, because with all my heart I believe, that I and the other people like me, Jewish or not, understand that actions have consequences. My God told my people that we are His "partners in creation", that on our shoulders rest the globe of the Living Earth, and that we are responsible for her safety. It does not matter who circles around whom, as long as the light of the sun touches the green leaves and the faces of our children. I don't care how loud Ayn Rand screams - I shall not shrug! Susan has explained to me your situation with the Yeshiva. You have my sympathy and understanding. All I can say is what my very wise Hassidic teacher, once told me: "Don't confuse the Judaism with the Jews, and Hassidus with the Hassidim". I wanted to let you know that I did not plagiarize your "flat Earth" and the "abyss" beyond it. I came up with this idea awhile ago, but, at the time,I did not write at all. I hope that you can enjoy the philosophical aspects of my response to your article, and not cringe too much at my frequent mentioning of "The Real or The Metaphorical God"